Homafar, Milad, Pourjafar, Mohammad Reza. (1397). Knowledge-based Activities of Site Selection by Fuzzy ELECTRE Method, Case Study: Tehran Metropolitan Area. معماری و شهرسازی آرمان شهر, 11(22), 95-106. Milad Homafar; Mohammad Reza Pourjafar. "Knowledge-based Activities of Site Selection by Fuzzy ELECTRE Method, Case Study: Tehran Metropolitan Area". معماری و شهرسازی آرمان شهر, 11, 22, 1397, 95-106. Homafar, Milad, Pourjafar, Mohammad Reza. (1397). 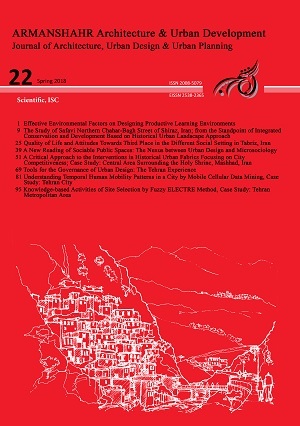 'Knowledge-based Activities of Site Selection by Fuzzy ELECTRE Method, Case Study: Tehran Metropolitan Area', معماری و شهرسازی آرمان شهر, 11(22), pp. 95-106. Homafar, Milad, Pourjafar, Mohammad Reza. Knowledge-based Activities of Site Selection by Fuzzy ELECTRE Method, Case Study: Tehran Metropolitan Area. معماری و شهرسازی آرمان شهر, 1397; 11(22): 95-106. 1Ph.D. in Urbanism, Department of Urbanism, Qazvin Branch, Islamic Azad University, Qazvin, Iran. 2Full Professor of Urban Design, School of Art, Tarbiat Modares University, Tehran, Iran. This research aims to identify the economic logic in the process of locating and the spatial transmitting of the knowledge-based institutions in Iran while on the macro and micro levels, it seeks to find an optimal location for the knowledge-based activities in Tehran. The research method is mixed and statistical population of this research includes a number of 879 knowledge-based companies which are officially registered in the vice-president of the information technology ministry. In order to identify the impactful criteria on site selection of the corporations in Iran, Delphi method is used. The sample size for the Delphi method includes 50 samples; interviews with managers in the knowledge-based companies. In order to set the extracted priority of the criteria, the Shannon entropy method and MCDM software was employed, then selection of different regions with higher priority was done by overlaying and using the Fuzzy ELECTRE method. On the second step, the mentioned bank of data was setup in GIS using the data from 2010 census and field research, finally a number of locations was specified for the optimal settlement of knowledge-based institutions by using Fuzzy ELECTRE method. Results show that the advantages of using the localization economies are playing a bolder role in site selecting rather than the advantages from the urbanization economies. Results of the local analysis show that the district 5, 2 & 4 have the most attraction for the settlement of active institutions in the field of knowledge. Acs, Z.J., & Audretsch, D.B. (1989). Small Firm Entry in US Manufacturing. Economica, 56, 255-265. Anselin, L., Varga, L., & Acs, Z. (1997). Local Geographic Spillovers between University Research and High Technology Innovations, Journal of Urban Economics, 42(3), 422-448. Audretsch, D., & Vivarelli, M. (1996). New-firm Formation in Italy: A First Report. Economic Letters, 48(1), 75-81. Boschma, R., Eriksson, R., & Lindgren, U. (2009). How Does Labour Mobility Affect the Performance of Plants? The Importance of Relatedness and Geographical Proximity, Journal of Economic Geography, 9, 169–190. Bum, S. (2006). Tehran Strategic-structural Plan. The Architecture and Urban Planning Researchs and Studies Center of Iran. Bylaws Regarding the Recognition of Knowledge-based Companies and Institutions. (2011). Retrieved from: www.sshi.um.ac.ir/images/36/stories/menu/111aa.doc. Capello, R. (1999). Agglomeration Economies and Urban Productivity : Location vs Agglomeration Economies. ERSA Conference Papers Ersa99pa354, European Regional Science Association. Cappellin, R. (1988). Transaction Costs and Urban Agglomeration, Révue d’Economie Régionale et Urbaine, 2, 261-278. Creswell, J. (1998). Qualitative Inquiry and Research Design: Choosing Among Five Traditions. Thousand Oaks, London, Sage. Davis, S., & Botkin, j. (1999). Emergence of Knowledge-oriented Business in the Creation of Value in Networking Economy, (H, Hosseinian. Trans). Don Tapscott, Afra Publications. Desmet, K., & Fafchamps, M. (2005). What Are Falling Transport Costs Doing to Spatial Concentration Across U.S. Counties? Journal of Economic Geography, 5, 261-284. Fafchamps, M., & Hamine, S. (2017). Firm Productivity. Wages and Agglomeration Externalities, Research in Economics, 71, 291-305. Feldman, M., & Audretsch, D. (1999). Innovation in Cities: Science-based Diversity, Specialization and Localised Competition, European Economic Review, 43, 409-429. Feser, E. (2002). Tracing the Sources of Local External Economies, Urban Studies, 39, 2485-2506. Foray, D. (2004). Economics of Knowledge, CA, MIT Press. Fujita. M., Krugman, P., & Venables, A. (2001). The Spatial Economy: Cities, Regions, and International Trade, CA, MIT Press. Hall, P., & Pain, K. (2006). Polycentric Metropolis: Learning form Mega-city in Europe, London, Sterling. He, J., & Gebhardt, H. (2014). Space of Creative Industries: A Case Study of Spatial Characteristics of Creative Clusters in Shanghai. European Planning Studies, 22(11), 2351-2368. Henderson, V. (1997). Externalities and Industrial Development. Journal of Urban Econ, 42, 449–470. Jacobs, J. (1969). The Economy of Cities. Random House, New York. Kazzazi, A., Amiri, M., & Rahbar Yaghoobi, F. (2011). Evaluation and Ranking Strategies with ELECTRE III Techniques in Fuzzy Situation, Case Study Conducted at Temad Co. Industrial Management Studies, 8(20), 49-77. Lee, M.N.N. (2004). Restructuring Higher Education in Malaysia. Retrieved from: www.cshe.nagoyau.ac.jp/seminar/kokusai/lee.pdfwww.cshe.nagoyau.ac.jp/seminar/kokusai/lee.pdf Accessed on 1395/1/8. Malmberg, A., & Maskell, P. (2002). The Elusive Concept of Localization Economies, Towards a Knowledge-based Theory of Spatial Clustering, Enviroment and Planning (A), 34, 492-449. Malmberg, A., Solvell, O., & Zander, I. (1996). Spatial Clustering, Local Accumulation of Knowledge and Firm Competitiveness, Geografiska Annaler, Series B, Human Geography, 78(2), 85-97. Maskell. P., Eskelinen, H., Hannibalsson, I., Malmberg, A., & Vatne, E. (1998). Competitiveness, Localised Learning and Regional Development: Specialisation and Prosperity in Small Open Economies.London, Routledge. Mehrara, M., & Rezaei, M. (2015). Knowledge Economy Index (KEI) in Iran and Comparison with other Countries of Region: The Vision 1404 Document. International Journal of Applied Economics Studies, 3(2), 1-7. Momeni, M. (2009). Fundamentals and Basis of Regional Planning. Najafabad, Azad University of Najafabad Press. Nazeman, H., & Eslamifar, A. (2011). Knowledge-based Economy and Sustainable Development, Financial Monetary, 17(33), 2-33. Neo, H. (2008). Cyberjaya: The Heart of a Nation’s ICT Agenda (Second Edition), Cyberjaya, MDeC. OECD . (1999). Main Trends Towards Knowledge-based Economies. OECD. Parcero, J. O., & Ryan, J. C. (2016). Becoming a Knowledge Economy: The Case of Qatar, UAE, and 17 Benchmark Countries, Journal of Knowledge Economy, 8, 1146-1173. Park, K. (2001). Identification of Site Selection Factors in the U.S. Franchise Restaurant Industry: An Exploratory Study. Virginia Polytechnic Institute and State University, Blacksburg, VA, Retrieved from: https://theses.lib.vt.edu/theses/available/etd-01112002-135621/. Porter, M.E. (1998). Clusters and the New Economics of Competition, Harvard Business Review, 20, 77-90. Power, D. & Lundmark, M. (2004). Working through Knowledge Pools: Labour Market Dynamics, the Transference of Knowledge and Ideas, and Industrial Clusters. Urban Studies, 41, 1025–1044. Ramirez, M. & Xibao, Li. (2008). Learning and Sharing in a Chinese High-technology Cluster: A Study of Inter-firm and Intra-firm Knowledge Flows between R&D Employees. SPRU Electronic Working Paper Series. Brighton, The Freeman Centre, University of Sussex. Rocco. R. (2007). An Urban Geography of Globalisation: New Urban Structure in the Age of Hyper-Connectivity. International Forum on Urbanism. Delft. Romer, P.M. (1986). Increasing Returns and Long Run Growth, Journal of Political Economy, 94, 1002-1037. Rosenthal, S., & Strange, W. (2004). Evidence on the Nature and Sources of Agglomeration Economies.Handbook of Regional and Urban Economics, Amsterdam, Elsevier. Shin, H. (2001). Disclosures and Asset Returns. Econometrica, 71, 105–133. Statistical Center of Iran. (2010). Results of Census Regarding the Workshops with Permits for Research and Development Activities. Available from: www.amar.org.ir, Accessed September 4, 2016. Statistical Center of Iran. (2015). Results of Census Regarding the Workshops with Permits for Research and Development Activities. Retrieved from: www.amar.org.ir. Technology Exchange Network. (2004). Virtual Monthly Journal of Payam-e-sadaerat-e Kala and Knowledge-based Services,15, 8-9. Tehran’s Comprehensive Transport and Traffic Research Corporation (2008). The Comprehensive Transport and Traffic Plan in Tehran, (1), Not Published. Varga, A. (1998). University Research and Regional Innovation: A Spatial Econometric Analysis of Academic Technology Transfers. Springer Science & Business Media. Von Zedtwitz, M. (2004). Managing R&D in China. R&D Management, 34, 341–343. World Bank (2007). Building Knowledge Economies: Advanced Strategies for Development. Washington, DC, World Bank. www.daneshbonyan24.ir. Retrieved September 1, 2015.
www.amar.org.ir. Retrieved May 12, 2016.
www.daneshbonyan.isti.ir. Retrieved September 4, 2015.